We have now completed our tour of the intramural wards of the City of London, and should now turn our attention to the extramural wards. We begin at Aldgate, the main eastward-facing gate of the city, and we will follow, once again, the course of the Roman and Medieval walls, but this time in a northerly and westerly direction, and on the outside, rather than the inside of the walls. 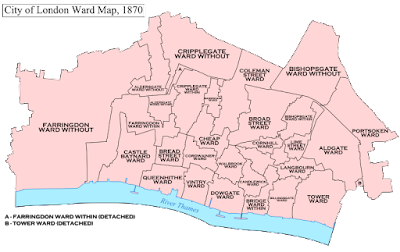 Some of these wards will merit more than one post, being larger than many of the intramural wards, and having more complex histories. Portsoken Ward lies immediately beyond Aldgate. 1870 map of London Wards. Image: Doc77can (licensed under CCA). "This Portsoken, which soundeth the franchise at the gate, was sometime a guild, and had beginning in the days of King Edgar, more than six hundred years since. There were thirteen knights or soldiers, well-beloved to the king and realm, for service by them done, which requested to have a certain portion of land on the east part of the city, left desolate and forsaken by the inhabitants ... They besought the king to have this land, with the liberty of a guild for ever. The king granted to their request, with conditions following: that is that each of them should victoriously accomplish three combats, one above the ground, one under ground, and the third in the water; and after this, at a certain day in East Smithfield, they should run with spears against all comers; all of which was gloriously performed; and the same day the king named it Knighten Guild, and so bounded it, from Aldgate to the place where the bars now are, toward the east, on both sides of the street, and extended it towards Bishopsgate in the north ... "
The King Edgar referred to must surely be Edgar the Peaceable, who reigned from 959 to 975 AD. Smithfield was frequently used for jousting and tournaments in the High Middle Ages, but this was a tradition that emerged only after the Norman Conquest. For clues as to what may have been involved here, we must look, on the one hand, to archaeological evidence beyond London; and, on the other hand, to literary sources. 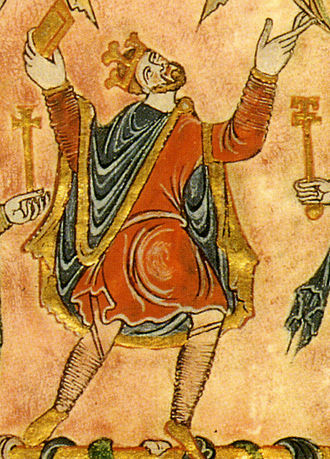 King Edgar the Peaceable, from the New Minster Charter (image is in the Public Domain). The equipment of elite Anglo-Saxon warriors has been recovered from excavations on a number of sites, including Sutton Hoo, the City of York, Abingdon, and, most recently, the Staffordshire Hoard. The latter is, perhaps, the most surprising discovery: it had previously been assumed that a heavily embellished sword such as those found at Sutton Hoo and Abingdon, would be wielded only by a king, but the Eighth Century hoard includes the decorated pommels of more than seventy of these weapons. The "combats" above ground may simply have been display fights or non-lethal contests between these elite warriors, or they may have involved wrestling, and similar trials of strength. The 9th Century Abingdon Sword. Photo: Geni (licensed under GNU). A 12th Century font at Eardisley, Herefordshire, depicts knights in single combat. Although post-Conquest, the art-work is clearly suggestive of an earlier tradition. Photo: Poliphilo (licensed under CCA). "Then the bold warrior stood up beside his shield, resolute beneath his helm. Wearing his grim mail he strode up to the stony cliffs, trusting in the strength of one man alone - such is no craven's feat! Then he who, with manly virtue, had passed through many a host of battles and a clash of war, when the ranks of men smote together, saw now at the mound's side a stone-arch standing from whence a stream came hurrying from the hill. The boiling water of that hill was hot with deadly fires; no man could long while endure unscorched that deep place nigh the hoard by reason of the dragon's flame .. " (translation by J.R.R. Tolkien). 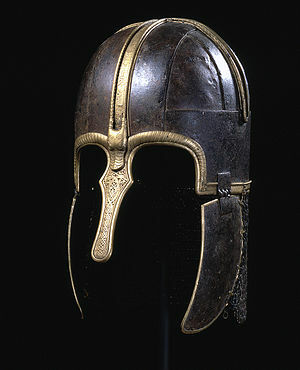 The Anglo-Saxon helmet from Coppergate, York, 700-820 AD. Photo: York Museums Trust Online Collection (licensed under CCA). 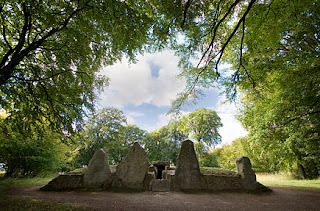 No such mounds are to be found in the immediate vicinity of London, but might such fights have been staged around monuments such as Wayland's Smithy in Oxfordshire, or Coldrum long-barrow in Kent? Wayland's Smithy, Oxfordshire. Photo: Msemmett (licensed under CCA). Beowulf may, similarly, provide us with a clue as to the "combat" in water. As a young man, the hero had competed in swimming competitions, sometimes wearing armour. Members of the re-enactment society, Regia Anglorum, have tried this out, even swimming in mail-shirts: "The effect is to place your body in a more legs-down position in the water. This makes for tiresome swimming, and we found that the breast-stroke was the only really viable way to swim." Might such contests have been held in the Thames at slack water? The running with spears at "all comers" may have provided an opportunity, using non-lethal weapons, for young men to test and prove their prowess, perhaps, in time, gaining admission to the Guild itself, on the death or retirement of older members. Stow tells us that, in 1115, the descendants of these "knights" gifted the land to the Priory of Holy Trinity Within Aldgate. Among those named are some whose origins must surely have been Anglo-Saxon (Edward Hupcornehill, Blackstanus, Alwin, Wiso, the sons of Leafstanus the goldsmith); and others whose names are unambiguously Norman (Radulphus Fitalgod, Wilmarde le Deuereshe, Orgare le Prude, Hugh Fitzvulgar, Algare Secusme), presumably the descendants of the daughters of Anglo-Saxon "knights" who married Norman ones. Within the ward is also a church dedicated to Saint Botolph, a Seventh Century East Anglian abbott. Whilst the present church dates to the Eighteenth Century, its origins are likely to be pre-conquest. It is one of four London churches dedicated to him, all of which stand (or stood) outside city gates on major route-ways (the others being St Botolph Billingsgate, St Botolph Aldersgate and St Botolph Bishopsgate). Saint Botolph was the patron saint of wayfarers and travelers, so these were churches at which outgoing travelers could pray for a safe journey, and incomers give thanks for one. One has to wonder whether these churches replaced earlier Pagan shrines to Janus, who played a similar role. The Church of Saint Botolph, Aldgate. Photo: Superbfc (licensed under GNU). Fascinating, as always. I don't know why I tend to forget London's Saxon history, but it's good to be reminded of it. Excellent article, I really enjoyed that! There's not much of Saxon London visible above ground - just one arch, I think, in the church of All Hallows by the Tower - but there's a fair amount in the Museum of London.